Lindberg eyewear NOW Collection Women. Available Downtown and in Bel Air. Today is Independent Eyewear Day! Celebrating the designers, products and shops that still embrace quality, service and beautiful handmade products. We still have a passion for this industry and love our customers and the products we represent. Not all eyewear is interchangeable, no matter how it's portrayed in the media or other advertisements. 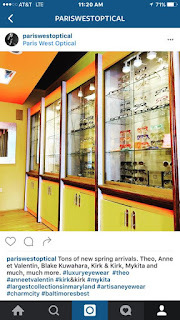 Stop in for expert frame styling, lens consultation and the largest collection of artisan eyewear in Maryland. Mention this post today or tomorrow and take $50 off your complete eyewear purchase or $25 off your frame/lenses only purchase. Let us show you the difference that decades of experience and the finest in quality can make! Along with FACEBOOK it's the place to get the most updates of all the happenings here at Paris West. We have so many new and exciting things planned as we approach our 21st birthday...Amazing new collections from State Optical Co, Kirk & Kirk, Blackfin, Blake Kuwahara, PlaToy, Sabine Be, Marcel Wanders, WOOW, Roger Dutch Eyewear, iGreen Custom and more. New sunglass collections from reborn classics like Vuarnet, Revo and Randolph Engineering. New arrivals from our favorites, Bevel, Barton Perreira, Oliver Peoples, Mykita, Lindberg, Dita, Thom Browne, Theo, Anne et Valentin, Etnia Barcelona, JF Rey, Pro Design, LA Eyeworks, Jono Hennessey, Carter Bond, DeStijl, Oakley, Maui Jim, Kaenon, Persol, Cazal and so many others I can't mention them all. Also our new "GoldStar Close Out Spex" shop within a shop is almost ready... where we have over 1000 amazing models available at closeout prices of 50% off. Safilo by Marcel Wanders. Among the hundreds of new Spring styles in stock now!